After months of criticism for her response to the terrorist attack in Benghazi, U.N. Ambassador Susan Rice has withdrawn her name from consideration for secretary of State, the White House said on Thursday. Amid heavy pressure from Republican opponents and potential political backlash if she were nominated to succeed Secretary of State Hillary Clinton, Rice said in a letter to President Obama that she wanted to avoid a distraction. Rice also thanked the president for his “unwavering confidence.” Obama said in a statement that Rice was “an extraordinarily capable, patriotic, and passionate public servant,” and regretted how she was treated in recent months. Congressional Republicans, including Armed Services ranking member John McCain, R-Ariz., Lindsey Graham, R-S.C., and Kelly Ayotte, R-N.H., have for months decried the Obama administration’s changing account of the attack on the U.S. compound in Benghazi. And despite meeting with her critics, she failed to ease their concerns. Whether a Rice nomination would be able to pass the Senate was in question, with Republicans blasting Rice’s appearance on television shows in which she said the September 11 attack began as a spontaneous protest linked to anger over an anti-Muslim film, instead of calling it a terrorist attack. The announcement means that the other top contender for the post, Senate Foreign Relations Chairman John Kerry, D-Mass., may have a clearer shot. However, if Kerry leaves the chamber, fellow Massachusetts Sen. Scott Brown, a Republican, would have the opportunity to regain the Senate seat he lost to Democrat Elizabeth Warren in the November elections. Democrats, having already spent almost $40 million to boost Brown, may not be able to overcome him in a special election. NBC News first reported her decision. Rice will also appear on Rock Center with Brian Williams on Thursday night. 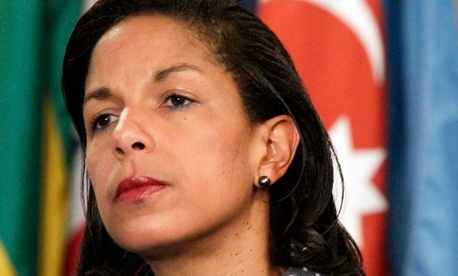 Click here to read Rice's letter to Obama.